Join the Chicago Illini Club and the Alumni Association for the biggest pregame party of the year at Soldier Field on September 14. Fighting Illini Athletics, along with the University of Illinois Alumni Association and University of Illinois Foundation, will be hosting a free "Illini Fest" tailgate event prior to the Sept. 14 Chicago Homecoming game at Soldier Field. Fans will be able to enjoy live music, food, interactive games and much more (see list below) next to Soldier Field on the southeast lawn four hours prior to the 5 p.m. game between Illinois and Washington. The event also will feature on-site vendors selling food and drinks, plus appearances from the Marching Illini, cheerleaders, and past Illini greats, providing the perfect tailgate experience for the 125,000+ alumni in the Chicagoland area as well as all Illinois football fans. "Illini Fest will be a great way for alumni and Illini fans of all ages to enjoy a full day of tailgating and fun outside historic Soldier Field," said Jennifer Larson, Assistant Athletic Director for Sales & Marketing. "We want to take our game day atmosphere from Champaign, where thousands of orange-clad fans tailgate around the stadium on football Saturdays, up to Chicago for this game. With live music, food, drinks, games, the Marching Illini, cheerleaders and more, followed by a great matchup in prime time, it will certainly be a memorable experience for all Fighting Illini fans." What: Live music and entertainment, face painting, interactive games for kids and adults, free snow cones and cotton candy, giveaways, appearances by the Marching Illini and Fighting Illini cheerleaders, appearances and autographs by Fighting Illini all-time greats, food and drink for purchase, and much more! Fighting Illini fans and UI students can save gas money and parking fees for the Chicago Homecoming game by booking a bus ticket to Soldier Field for the Illinois-Washington matchup. Fans can take advantage of a Game Day Motorcoach Package to and from the game for $69 (buy online), while UI students, who get a FREE ticket to the game with the purchase of a 2013 season ticket, can purchase bus transportation to the game for just $22 (buy online). 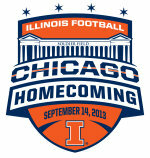 Tickets for the Chicago Homecoming game start at $30 and are on sale now. Season tickets for the 2013 Illinois football season, which includes seven home games, are on sale now for as low as $99.